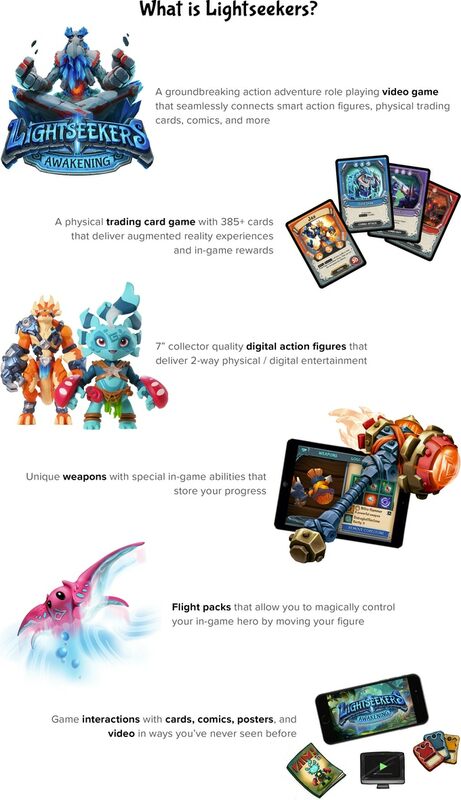 Lightseekers Awakening is a next generation adventure role playing video game connecting smart action figures, trading cards, & comics in ways never seen before. Every element of the Lightseekers universe interacts with our game. That means physical trading cards, digital action figures, comics, posters, packaging, videos and more will unlock additional rewards and new content. Everything works together to make your gaming experience even more compelling. The more support we receive, the more we will create that will enhance the Lightseekers game and reward you, the player. A Large, Open World to Explore: Lightseekers takes place on the fantastical planet, Tantos. Unlike many other games, Tantos is not built from a series of small levels. We've taken great care to make Tantos a living, breathing, ever-changing world with thousands of hours of repeatable gameplay, that caters to the needs of even the most adventurous explorers. Lightseekers Awakening can be purchased online here.